Finally, an easy but useful project that can be completed in a few hours. 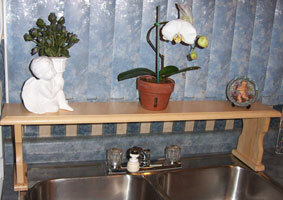 This over-the-sink shelf can be constructed from softwood or hardwood. It can be used for a multitude of applications, but my favourite is simply holding small houseplants. The measurements in this plan are for a standard double 32" sink. For other sinks, you can adjust the length measurement accordingly. You don�t need fancy tools to complete this project: wood glue, a drill, a wood saw, a hack saw and a sanding block. Of course using �" corner round bit with a router makes a nice edge but a sanding block will work as well. The whole project can be constructed from one piece of wood measuring 7 �" wide by 72" long by 3/4"thickness. 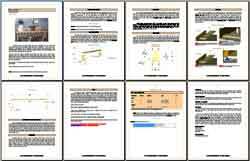 Click here to download this plan in PDF now! You will need Adobe Acrobat Reader to view your plans. Click below to get your free copy.